Son of Saul (Hungarian: Saul fia) is a 2015 Hungarian drama film directed by László Nemes, in his feature directorial debut, and co-written by Nemes and Clara Royer. It is set in the Auschwitz concentration camp during World War II, and follows a day-and-a-half in the life of Saul Ausländer (played by Géza Röhrig), a Hungarian member of the Sonderkommando. The film premiered at the 2015 Cannes Film Festival, where it won the Grand Prix. It was also shown in the Special Presentations section of the 2015 Toronto International Film Festival. The film won the award for Best Foreign Language Film at the 88th Academy Awards. It is the ninth Hungarian film to be nominated for the award, and the first one since István Szabó's Hanussen in 1988. It is the second Hungarian film to win the award, the first one being Szabó's Mephisto in 1981. It also won the Golden Globe for Best Foreign Language Film, becoming the first Hungarian film to win the award. In October 1944, Saul Ausländer (Géza Röhrig) works as a Sonderkommando Jewish–Hungarian prisoner in Auschwitz. His job is to salvage valuables from the clothing of the dead, drag bodies from the gas chambers and scrub the chambers before the next group arrives to be gassed. He works stoically, seemingly having been numbed by the daily horrors. One day following the gassing, he finds a boy who survived the gas, but is unconscious. From a distance, Saul witnesses a Nazi physician check vital signs, then methodically suffocates the boy and calls for an autopsy. Saul steps forth and insists on carrying the body himself to the prison doctor, Miklós (Sándor Zsótér), a fellow Hungarian prisoner and a forced assistant to Josef Mengele. He asks Miklós to not perform the autopsy so he can give the boy a proper Jewish burial. Miklós declines his plea, but allows him time alone with the boy before the autopsy and subsequent cremation. Saul returns later and steals the boys body and goes in search of a Rabbi to perform the ritual. He goes to Rabbi Frankel (Jerzy Walczak [pl]) in the crematorium, who dismisses Saul's concern and suggests that Saul perform the burial himself. Saul overhears Sonderkommando Abraham (Levente Molnár), talk about an uprising against the SS-guards with Oberkapo Biedermann (Urs Rechn). Biedermann first wants to photograph the camp's atrocities using a camera collected from the clothing of an earlier gassed caravan, and smuggle the pictures outside to attract attention and help. Saul asks for another rabbi and Abraham tells him of "the Renegade," a Greek Rabbi who has lost his faith. Saul in return offers his assistance in their plan and is instructed to go with a prisoner (Katz) to repair a shack; he is given a piece of jewellery for use as a bribe in case he's caught. When Saul and Katz arrive at the shack, Saul pretends to fix the front door's lock, while Katz takes out a camera from inside the shack and starts to take pictures of the cremation. Saul hears the guards and hides the camera outside in a drain. The guards search the shack, only to find nothing. Saul then sneaks onto a truck for another Sonderkommando unit, heading to a nearby riverbank, where the ashes from the crematoria are dumped into the river. Saul finds the Renegade, who refuses to help him. Saul then threatens to alert the Oberkapo of the unit, Mietek (Kamil Dobrowolski), that the Renegade is a rabbi by reciting the Kaddish. When the Renegade refuses yet again Saul throws the man's shovel into the water. The rabbi jumps into the river in a half-hearted attempt to retrieve the shovel or drown himself. Saul, who can't swim, manages to bring the Renegade back to the riverbank and both are then taken to the SS-commandant of the unit (Christian Harting). After an interrogation, the Renegade is executed and Saul is allowed to go back to the unit. Saul is then confronted by Mietek, who realizes that he is from another unit. To mollify Mietek, Saul gives him the piece of jewellery. Back at the camp, following roll call, Saul sneaks into Miklós's office where he is caught by a group of Nazi officers. One of them pushes Saul around like a puppet and makes a mockery of Jewish dances, finally forcing him out of the room. After searching in vain for the boy's body, Saul confronts Miklós, who assures him that he has hidden it from the other doctors for safety. Saul sneaks into the autopsy room and takes the body back to his own barrack in a sack. That night Saul is summoned to clean the dinner tables by SS-commandant Moll (Uwe Lauer). Biedermann walks in and is ordered to write up a list of seventy names. This leads Biedermann to believe that his unit will soon be gassed. Biedermann discloses the information to Abraham, who instructs Saul to head to the women's camp, where he will pick up a smuggled package of gunpowder from a prisoner named Ella. When Saul finds himself face to face with Ella, he clearly knows her. She calls him by name, clasps his hand, but he withdraws. After collecting the package, Saul deliberately falls into a line of newly arrived Hungarian Jews, who are being led into the woods for execution. Saul again looks for a rabbi among the arrivals. A Frenchman named Braun (Todd Charmont) approaches him and convinces Saul that he is a rabbi. Saul disguises Braun as a member of the Sonderkommando and sneaks him into the camp. When Saul arrives at the camp he is confronted by Abraham and realizes that during the turmoil in the woods he has lost the package. On further questioning, he says that the dead boy is his illegitimate son, an assertion Abraham says is not true. The next morning during roll call, Miklós finds Saul and tells him that he needs a replacement body, similar to the one Saul has taken. The prisoners are then summoned into the crematorium to get back to work, where they discover that Biedermann and his unit have been gassed by the SS. Abraham starts a riot with the other prisoners and they attack the SS guards, starting the rebellion. After managing to escape from the crematorium, Saul retrieves the boy's body and escapes to the woods with Braun and few other prisoners. When they reach a river, Saul finds a chance to bury the body, only to discover that Braun is a fraud when he can't recite the Kaddish. When he hears the guards approaching, Saul tries to carry the body across the river. Unable to manage the current with the added weight, he loses his grasp on the sack and is pulled out of the river by Rabbi Frankel as the body floats away. When the prisoners arrive at a shed in the forest, they start to discuss a plan to join the Polish resistance. Saul notices a young peasant boy peeking into the shed and smiles at him, the only time he is shown with a smile. The boy runs away, and makes it a short distance before an SS officer grabs and silences him as guards run past in the direction of the shed. When they have all passed, the officer releases him, and the camera follows the boy into the woods, as the sound of gunfire echoes behind him. Nemes conceived of the film from the book The Scrolls of Auschwitz, a collection of testimonies by Sonderkommando members, after discovering it during the production of Béla Tarr's The Man from London in 2005 when he was working as Tarr's assistant. Nemes started working on the screenplay with Royer in 2010 and completed the first draft in 2011. The writers spent several years on research, while historians such as Gideon Greif, Philippe Mesnard and Zoltán Vági provided support for the film. The project struggled to find its financiers due to the film's unconventional approach and Nemes's lack of experience in directing a feature film. Originally intended to be a French production with a French protagonist, the film was produced entirely in Hungary. After potential co-production partners in France, Israel, Germany and Austria turned down the project, the €1.5 million budget was ultimately covered by the Hungarian National Film Fund, Hungarian tax credits and the Claims Conference, accounting respectively for 70%, 25% and 5%. Nemes insisted on casting actors who spoke their characters' own languages. New York City-based Hungarian poet Géza Röhrig, who had not acted in film since the 1980s, was cast as the main character, Saul, after being considered originally for a supporting role. The film was shot on 35 mm film in 28 days in Budafok, Budapest. A 40 mm lens and the Academy aspect ratio of 1.375:1 were adopted to realise shallow focus and a portrait-like narrow field of vision. Architect and liberal activist László Rajk, who also worked on the permanent Hungarian exhibition at the Auschwitz-Birkenau State Museum, designed the re-creation of the crematoria. The film took five months of sound design. Human voices in eight languages were recorded and attached to the original recording of the production. Sound designer Tamás Zányi described the sound in the film "as a sort of acoustic counterpoint to the intentionally narrowed imagery". The film premiered in competition at the 68th Cannes Film Festival on 15 May 2015, where it won the Grand Prix. The filmmakers initially tried to premiere the film at the 65th Berlin International Film Festival, but after the festival offered them a spot only in the Panorama section, not in the main competition, they decided to refuse the proposal and instead aim for the Cannes competition. In Hungary, the film was released on 11 June 2015 and sold more than 220,000 tickets, placing it as the highest-grossing domestic film released since the slapstick comedy Üvegtigris 3 in 2010. Upon its release at Cannes, the film was met with critical acclaim. On the review aggregator website Rotten Tomatoes, the film holds a 95% approval rating based on reviews from 220 critics, with an average rating of 8.88/10. The site's critical consensus reads, "Grimly intense yet thoroughly rewarding, Son of Saul offers an unforgettable viewing experience – and establishes director László Nemes as a talent to watch". On Metacritic, the film has a score of 90 out of 100, based on 46 critics, indicating "universal acclaim". In his review for The Guardian, Peter Bradshaw rated the film five out of five stars, calling it an "astonishing debut film" and "a horror movie of extraordinary focus and courage". He ended his review writing: "Nemes's film has found a way to create a fictional drama with a gaunt, fierce kind of courage...." Writing for Time Out, Dave Calhoun also gave the film five out of five stars. Indiewire's Eric Kohn awarded the film an A- rating, calling it "a remarkable refashioning of the Holocaust drama that reignites the setting with extraordinary immediacy". In his review written for The Hollywood Reporter, Boyd van Hoeij praised the cinematography and the soundwork of the film. He writes: "Shot (and shown in Cannes) on 35mm, often in sickly greens and yellows and with deep shadows, Erdely's cinematography is one of the film's major assets, but it wouldn't be half as effective without the soundwork, which plays a major role in suggesting what is happening around Saul, with audiences often forced to rely on the sound to imagine the whole, horrible picture". Writing for The Film Stage, Giovanni Marchini Camia gave the film an A rating, and called it "a towering landmark for filmic fictionalizations of the Holocaust". A.A. Dowd of The A.V. Club gave the film an A- rating, and praised the movie's unique perspective: "Son of Saul is the rare Holocaust drama that finds actual drama, and not just despair, in the living hell of a concentration camp". [...] "Son of Saul sees humanity in effort, identity in action; it watches someone with nothing, a man reduced to a statistic, get a piece of himself back, mostly by finding some meaning in a place of meaningless evil". Claude Lanzmann, director of the documentary Shoah, gave the film high praise, stating that "it's a very new film, very original, very unusual. It's a film that gives a very real sense of what it was like to be in the Sonderkommando. It's not at all melodramatic. It's done with a very great modesty". Philosopher Georges Didi-Huberman also praised the film, and he wrote a 25-page open letter to Nemes, which opened with "Your film, ‘Son of Saul,' is a monster. A necessary, coherent, beneficial, innocent monster". Nemes was questioned about the similarities between Son of Saul and the 2001 film The Grey Zone, with Nemes replying "But mine is an Anti-Grey Zone!" In a 2016 BBC poll, critics voted the film the 34th greatest since 2000. At the Cannes Film Festival the film won the Grand Prix and the FIPRESCI Prize in the main competition section. The film also won the François Chalais Prize and the Vulcan Award. At the 88th Academy Awards, Son of Saul won the Academy Award for Best Foreign Language Film. ^ "Son of Saul (15)". British Board of Film Classification. 3 November 2015. Retrieved 8 December 2015. ^ a b c d e f g h i j k Kilday, Gregg (16 November 2015). "How 'Son of Saul' Defied the Dangers of Re-Creating the Holocaust". The Hollywood Reporter. Retrieved 25 January 2016. 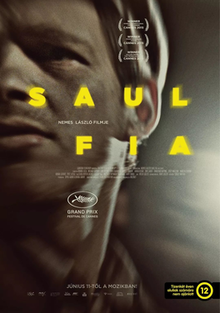 ^ "Saul fia (2015)". The Numbers. Retrieved 12 February 2018. ^ "In 'Son of Saul,' Laszlo Nemes Expands the Language of Holocaust Films". The New York Times. 14 December 2015. Retrieved 16 January 2016. ^ a b "2015 Official Selection". Cannes. Retrieved 16 April 2015. ^ a b c Szalai, Georg (28 February 2016). "Oscars: Hungary Wins Its First Foreign-Language Honor Since Fall of Communism". The Hollywood Reporter. Retrieved 29 February 2016. ^ "Son of Saul: Foreign Language Film - Nominees". Oscars. 14 January 2016. Retrieved 29 February 2016. ^ "Golden Globes: The Complete Winners List". The Hollywood Reporter. 11 January 2016. Retrieved 11 January 2016. ^ Nick Holdsworth (11 January 2016). "Golden Globes: Hungary Celebrates First-Ever Win for 'Son of Saul'". The Hollywood Reporter. Retrieved 16 January 2016. ^ Chare, Nicolas; Wiliams, Dominic. "How Documents Buried by Jewish Prisoners at Auschwitz Tell the Story of Genocide". Slate: The Vault. Retrieved 24 February 2016. ^ a b c "Son of Saul" (PDF). Films Distribution. Retrieved 25 January 2016. ^ a b Chang, Kee (17 May 2015). "From the Archives: Son of Saul". Anthem Magazine. Retrieved 25 January 2016. ^ a b c d e f Macnab, Geoffrey (13 November 2015). "Laszlo Nemes talks Hungary's Oscar submission 'Son Of Saul'". Screen Daily. Retrieved 25 January 2016. ^ Barraclough, Leo (27 May 2015). "Cannes: 'Son of Saul' Epitomizes Spirit, Ambition of Hungarian Cinema, National Film Fund Chief Says". Variety. Retrieved 25 January 2016. ^ Rodek, Hanns-Georg (26 May 2015). "Deutsche Verleiher meiden meinen Holocaust-Film". Die Welt (in German). Retrieved 25 January 2016. ^ Ács, Gábor (23 May 2015). "A Saul fia rendezőjével a díjeső után". Euronews (in Hungarian). Retrieved 25 January 2016. ^ a b c Egan, Jack (7 December 2015). "Director László Nemes Goes Inside Auschwitz in Son of Saul". Below the Line. Archived from the original on 2 February 2016. Retrieved 25 January 2016. ^ Su, Zhuo-Ning (8 October 2015). "'Son of Saul' Director László Nemes on Capturing a Portrait of Hell and the Spiritual Experience of Cannes". The Film Stage. Retrieved 25 January 2016. ^ Krezinger Szonja (21 March 2016). "A százezres nézőszám ma már inkább csak álom" (PDF). MTG Metro Gratis Kft. Metropol. p. 8. ISSN 2060-131X. Retrieved 23 March 2017. ^ Hudson, David (15 May 2015). "Daily - Cannes 2015 - Laszlo Nemes's SON OF SAUL". Keyframe. Retrieved 6 December 2015. ^ "Son of Saul (2015)". Rotten Tomatoes. Retrieved 18 October 2016. ^ "Son of Saul Reviews". Metacritic. Retrieved 22 January 2016. ^ Peter Bradshaw. "Son of Saul review: an outstanding, excoriating look at evil in Auschwitz". the Guardian. ^ "Son of Saul". Time Out London. ^ Eric Kohn (14 May 2015). "Cannes Review: Terrifying 'Son of Saul' is Unlike Any Oth - Indiewire". Indiewire. ^ Boyd van Hoeij. "'Son of Saul' ('Saul Fia'): Cannes Review". The Hollywood Reporter. ^ "[Cannes Review] Son of Saul". The Film Stage. ^ A.A. Dowd (17 December 2015). "The urgent Son Of Saul is a Holocaust drama like no other". The A.V. Club. ^ "'Son of Saul': A Holocaust film through a different lens". Jewish Journal. ^ a b "In 'Son of Saul,' Laszlo Nemes Expands the Language of Holocaust Films". The New York Times. ^ "Cannes Grand Prix Winner "Son of Saul": A Critical Review". The Huffington Post. ^ "The 21st century's 100 greatest films". BBC. 23 August 2016. Retrieved 8 November 2016. ^ a b "TOUTES LES RÉCOMPENSES DU FESTIVAL DE CANNES 2015". 23 May 2015. Retrieved 23 May 2015. ^ a b "A Saul fia megkapta a Francois Chalais-díjat is" ['Son of Saul' receives the François Chalais Prize]. Népszabadság Online. 23 May 2015. Retrieved 23 May 2015. ^ a b @Accreds (24 May 2015). "Cannes 2015: Vulcan Award of the Technical Artist to Tamas ZANYI, sound engineer for SON OF SAUL" (Tweet). Retrieved 24 May 2015 – via Twitter. ^ "ASC Awards: The Complete Winners List". The Hollywood Reporter. 13 January 2016. Retrieved 15 February 2016. ^ "The 2017 AFCA Awards". Australian Film Critics Association. Archived from the original on 13 March 2018. Retrieved 28 February 2018. ^ ""Le fils de Saul", Grand Prix de l'Union de la Critique de Cinéma" (in French). RTBF. 10 January 2016. Retrieved 10 January 2016. ^ Pond, Steve (6 December 2015). "'Ex Machina,' 'Room' Win Big at British Independent Film Awards". TheWrap. Retrieved 21 December 2015. ^ Giardina, Carolyn (21 November 2015). "'Carol' Wins Golden Frog at Camerimage". The Hollywood Reporter. Retrieved 9 January 2016. ^ Académie des César (26 February 2016). "BIRDMAN, réalisé par Alejandro González Iñárritu, #César2016 du Meilleur Film Étranger". Twitter. Retrieved 27 February 2016. ^ Dann Gire (16 December 2015). "'Mad Max: Fury Road' wins best picture from Chicago Film Critics". Daily Herald. Retrieved 18 December 2015. ^ "Critics' Choice Movie Awards". 17 January 2016. Retrieved 18 January 2016. ^ Chase Whale. "DFW Film Critics Association Dish Out 2015 Awards - Dallas Observer". Dallas Observer. Retrieved 18 December 2015. ^ "DGA Announces Nominees for Outstanding Directorial Achievement in Feature Film for 2015". Directors Guild of America. 12 January 2016. Retrieved 12 January 2016. ^ "'Carol' Sweeps Gay and Lesbian Entertainment Critics Awards". Variety. 18 January 2016. Retrieved 19 January 2016. ^ "Prix du Syndicat Français de la Critique 2015". Syndicat Français de la Critique. Archived from the original on 10 October 2014. Retrieved 2 February 2016. ^ "Golden Globe Nominations: The Complete List". The Hollywood Reporter. 10 December 2015. Retrieved 10 December 2015. ^ Folcker, Sebastian (23 January 2017). "De blev årets vinnare". SVT (in Swedish). Retrieved 23 January 2017. ^ Densby, Andrew (9 January 2016). "Houston Film Critics award "Spotlight," "Revenant"". Houston Chronicle. Retrieved 15 January 2016. ^ Meena, Jang (27 February 2016). "Spirit Awards: 'Son of Saul' Wins Best International Film". The Hollywood Reporter. Retrieved 28 February 2016. ^ King, Susan (6 December 2015). "'Spotlight' named best of 2015 by the Los Angeles Film Critics Assn". Los Angeles Times. Retrieved 14 December 2015. ^ ""Golden Camera 300" for Mátyás Erdély, the cinematographer of "Son of Saul"". Manaki Brothers Film Festival. Archived from the original on 1 February 2016. Retrieved 28 January 2016. ^ Lincoln, Ross A. (27 February 2016). "'The Revevant' & 'Mad Max: Fury Road' Tie At 2016 Golden Reel Awards: MPSE Winners List". Deadline Hollywood. Retrieved 28 February 2016. ^ Child, Ben (2 December 2015). "Mad Max: Fury Road eyes Oscars run after victory at National Board of Review awards". The Guardian. Retrieved 10 December 2015. ^ "'Carol' Takes Top Honors at New York Film Critics Awards". The Wall Street Journal. 2 December 2015. Retrieved 10 December 2015. ^ Pond, Steve (14 December 2015). "Online Film Critics Say 'Mad Max: Fury Road' Is Best". TheWrap. Retrieved 21 December 2015. ^ Chronicle Staff Report (14 December 2015). "S.F. Film Critics Circle honors 'Spotlight' and 'Brooklyn'". SFGate. Retrieved 18 December 2015. ^ Siegel, Tatiana (7 December 2015). "'Spotlight' Named Top Film by D.C.-Area Film Critics". The Hollywood Reporter. Retrieved 14 December 2015. This page was last edited on 6 April 2019, at 17:44 (UTC).